Team Clermont is a TEENAGER! Hey friends! If you’re around Athens Saturday, come celebrate our 13th Anniversary with us. 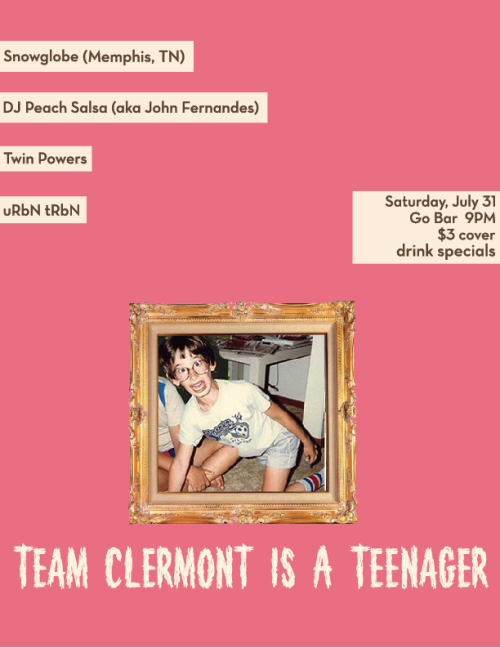 Team Clermont’s a teenager now, so expect some added sass and a few questionable dance moves. No need to steal a beer from your dad’s fridge for this party. Have your mom drop you off at Go Bar or ride your bike. Our good friends Snowglobe are coming down from Memphis to play a very rare Athens show, with DJ sets from Twin Powers, DJ Peach Salsa (John Fernandes of Olivia Tremor Control, Circulatory System, and countless other bands), and uRbN tRbN (our own Shil Patel spinning 90s hip hop and projecting Bollywood dance spectaculars). $3 cover to get Snowglobe some gas money.